Bobble Ball – Try it at Home! Finding your center of gravity is not just a turn of phrase. 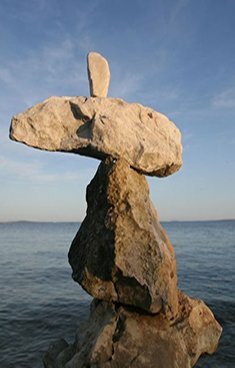 The center of gravity is actually the place where an object’s weight is balanced, as is demonstrated by the rocks in the picture. If an object is made up of one kind of material the center of gravity is usually in the middle of the object. However, if you add a heavier material to the first it throws off the center of gravity. In this experiment, this is demonstrated by the strange way the balloon moves. Step 1: Roll a piece of clay into a long string, like a snake, and drop it into the balloon. Step 2: Roll the balloon between your hands to form a ball of clay inside the balloon. Step 3: Inflate the balloon and tie it. Step 4: Place the bucket about 10 steps away from you. Try to toss the balloon into the bucket. What happens?